Innessence, domain Stokershorst is a nature domain with a chapel that has been converted in a retreat and yoga center, and a wellbeing lodge. The domain is located close to Eindhoven in the Netherlands, right at the Belgian and German border. We have 1P, 2P, and 4P rooms, all have a separate shower room and toilet. Our accomodation prices include breakfast, yoga and meditation classes. 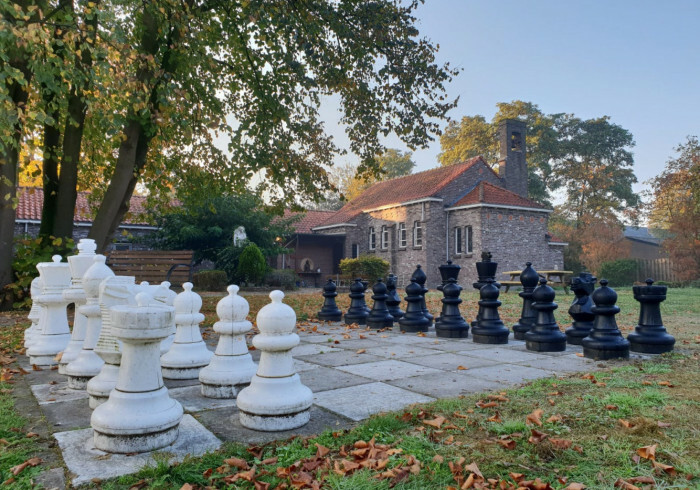 There is a winter terrace, a mini gym, wifi, a library, a 10m2 chess game, free parking, lots of animals, lots of hiking and bicycle paths to explore, national park De Peel on 2 km, and much more to discover. Come and relax at the domain, stay in one of our guest rooms, eat healthy vegetarian food, recharge your batteries with yoga, meditation, and other activities, and enjoy a hike in the nature. If you wish you can also volunteer at Stokershorst.